La vocales en Español- A, E, I, O, U! In first grade we are working on phonics in Spanish! First, we learn the vowels and practice beginning vowel sounds. There are only 5 vowel sounds in Spanish! A-ahh, E-ehh, I-ee, O-oh, U-oo. 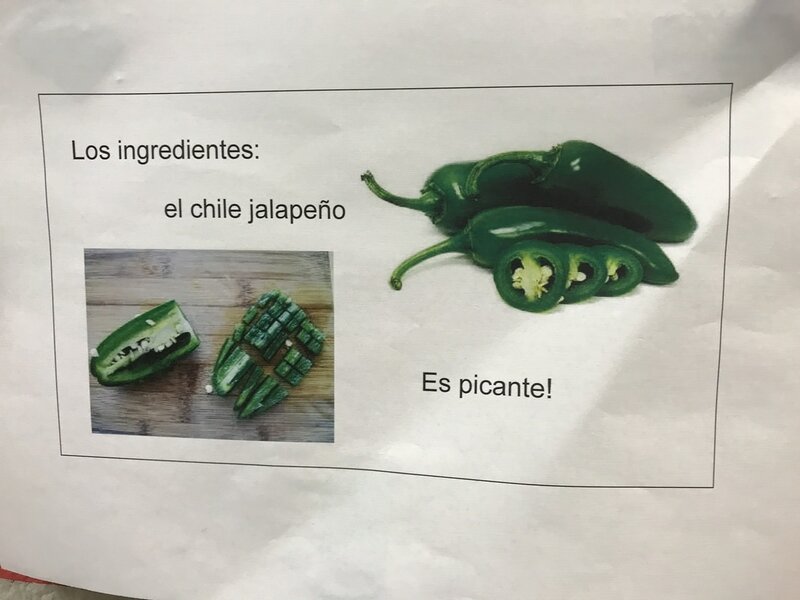 The Y often says ee as well. 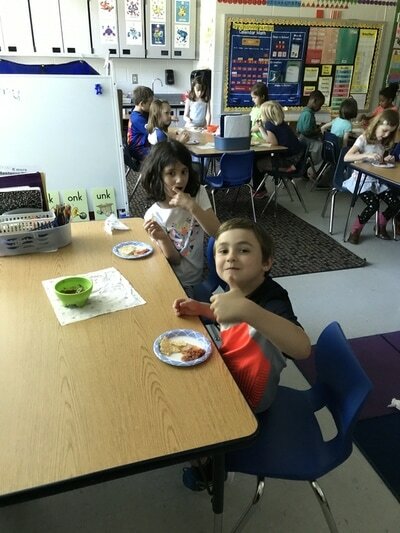 We are creating mini books and playing games to practice each vowel and learn new words at the same time. We are singing several songs and practicing traditional trabalenguas- tongue-twisters! 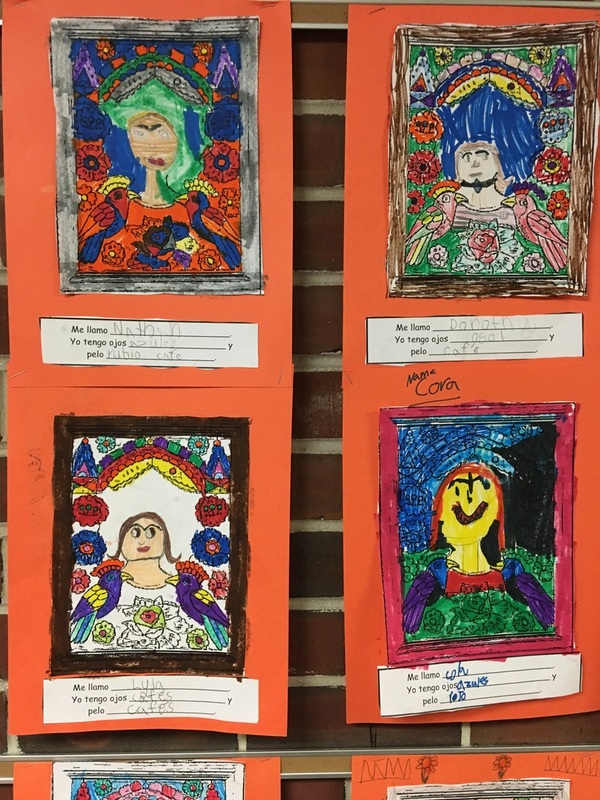 Look for these soon at home. 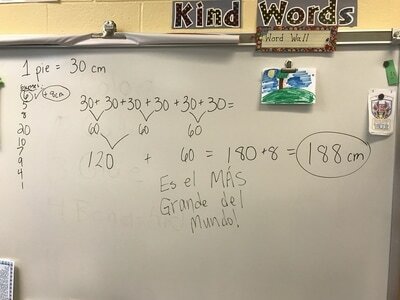 I will challenge the students to pick one to memorize and present, or look up a new one to practice! There are a ton online and on youtube that are kid-friendly. Next, we will start to add consonants to make syllables. 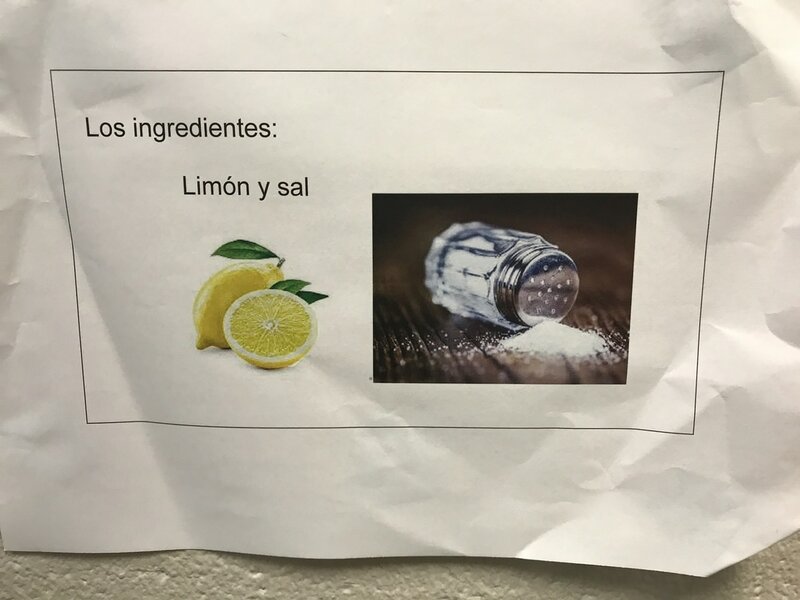 La, le, li, lo, lu! (Hey friend, buy me a coconut! 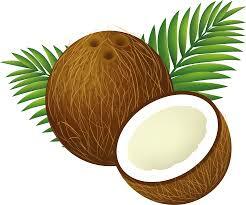 Friend, I dont buy coconuts! We had a lot of fun with these trabalenguas! 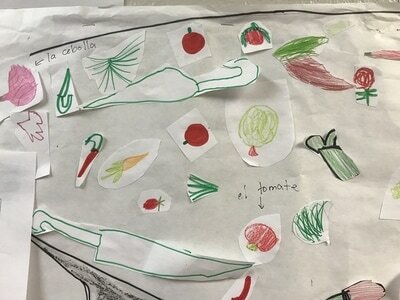 ​Here are a few students presenting. 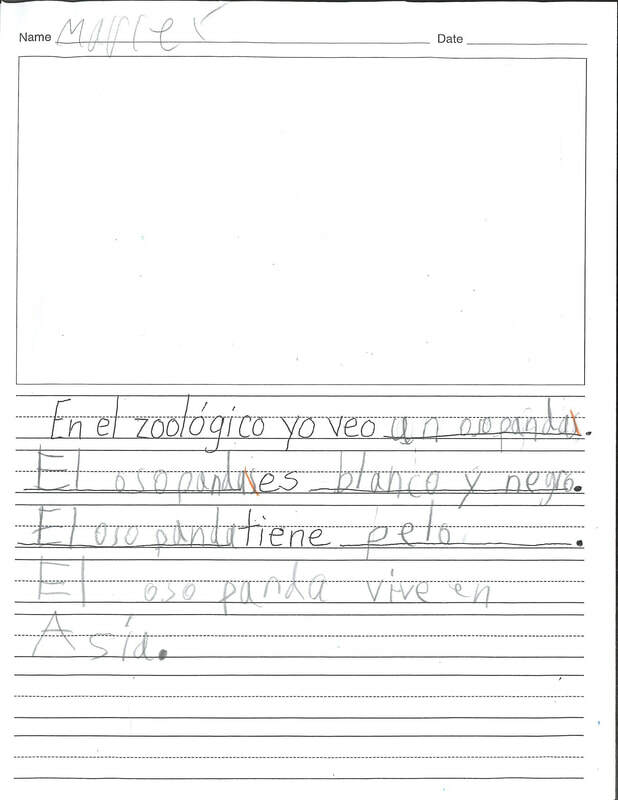 Students followed the example of writing an informational text in English to then write about an animal in Spanish! 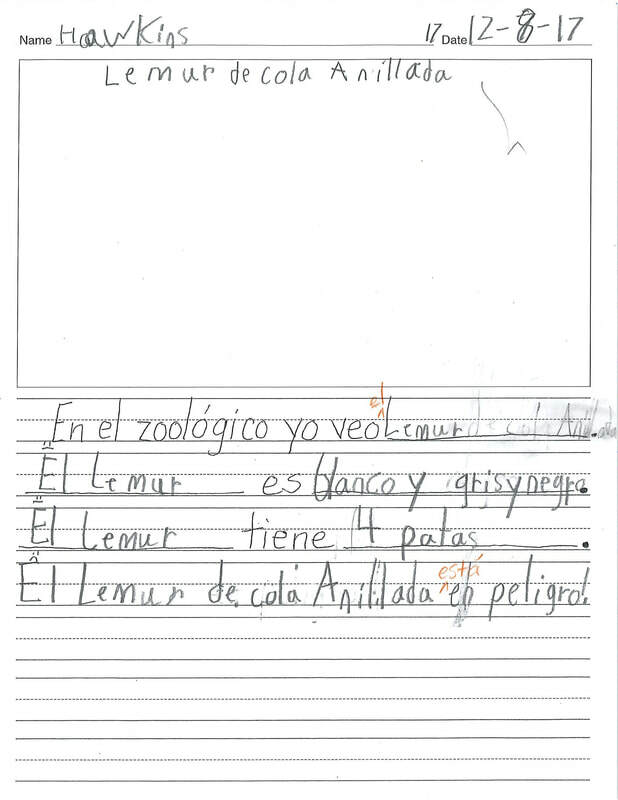 They used iPads to research an animal at the Zoo Madrid in Madrid, Spain. 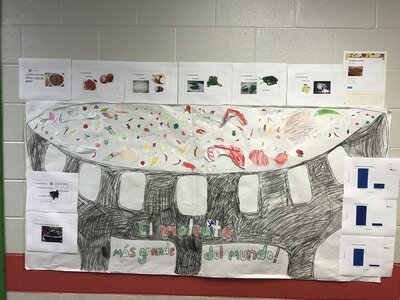 Students used their background knowledge of colors, size words, and body parts to describe an animal of their choosing from the Zoo Madrid website. 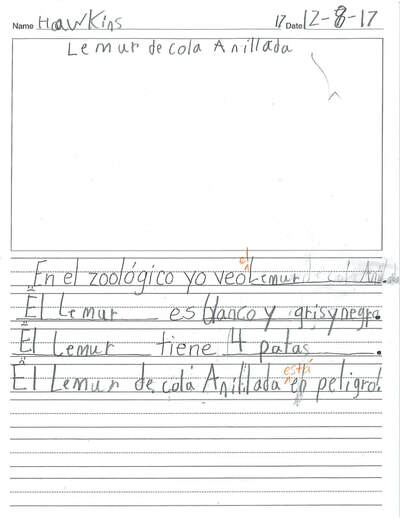 Then, they used the website to identify other details about their animal, like whether it is a carnívoro, herbívoro, or omnívoro, or a mamífero o reptile, or where the animal is found in the world (for example). They used the writing process to create multiple drafts and then conferenced with me to edit their work. They focused on showing craftsmanship in their writing and illustrations by following a checklist and getting feedback from Sra. García. ​MLE1.IP1F Provide simple responses using memorized words and phrases on topics such as self, family, school, etc. 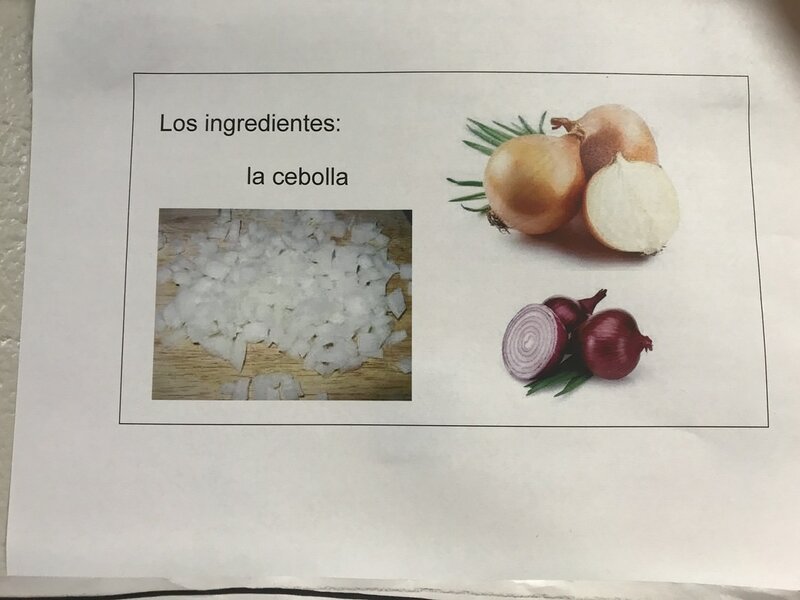 MLE1.P1B Share basic information about self and others. MLEI.IP2C Complete forms for basic information. MLEI.IP2B Make lists on familiar topics. 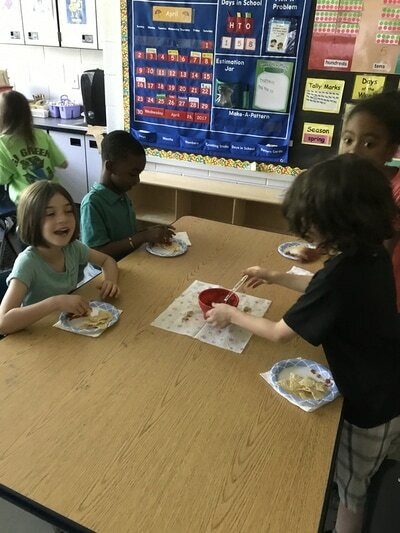 MLE1.INT2A Demonstrate comprehension through reading of age-appropriate materials and resources. 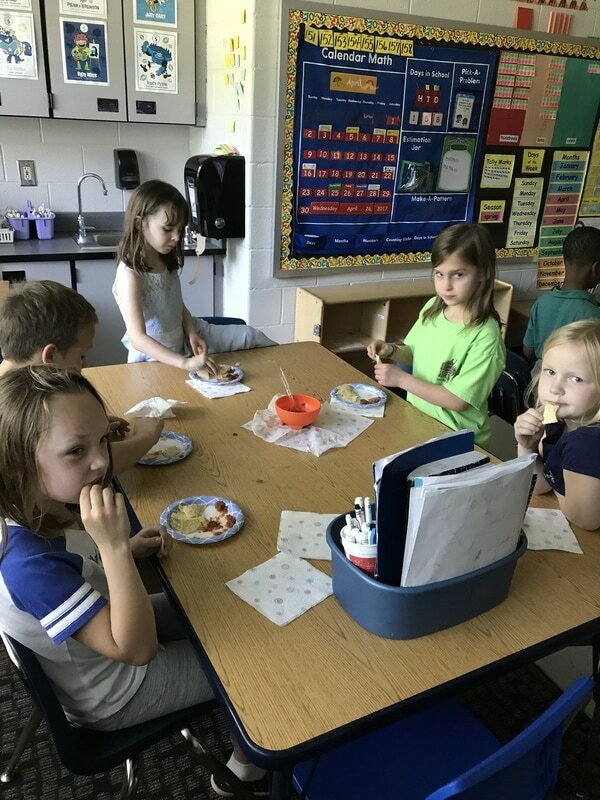 MLE1.CCC1B Connect basic skills learned in other subjects with skills learned in the target language. 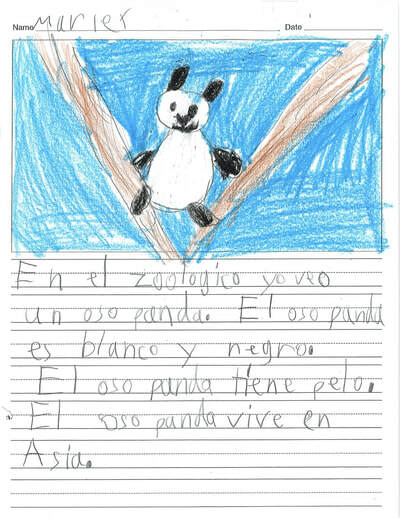 I can identify and describe animals around the world. I can read and write familiar words in Spanish. 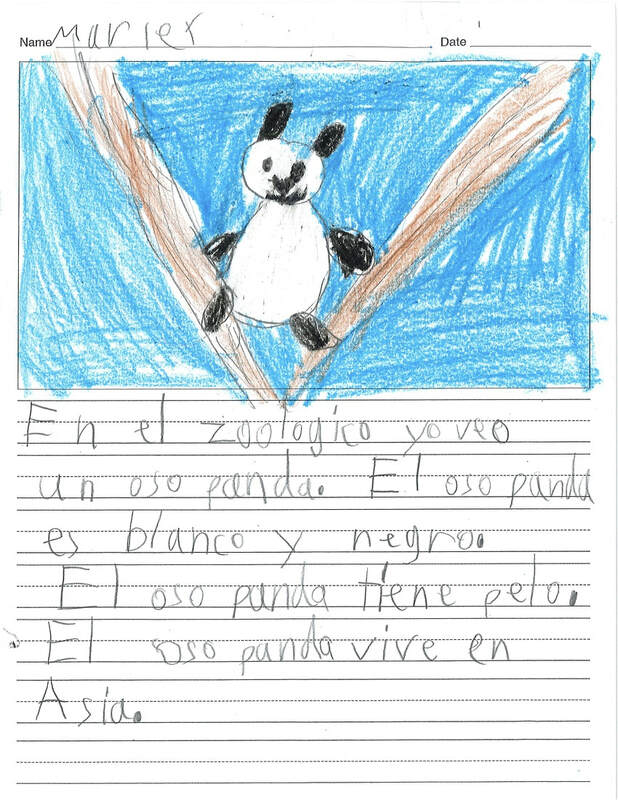 I can write short, simple sentences to describe an animal's color, size, and body parts. 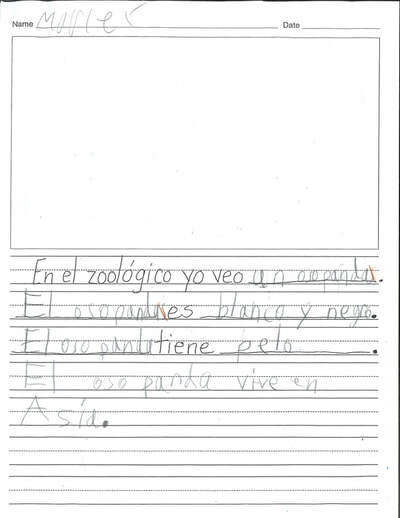 I can use the website, ZooMadrid.com to research extra details to add to my writing. The writing checklist helped students to stay on task, to include all the necessary details, and to show craftsmanship in their writing and illustrations. 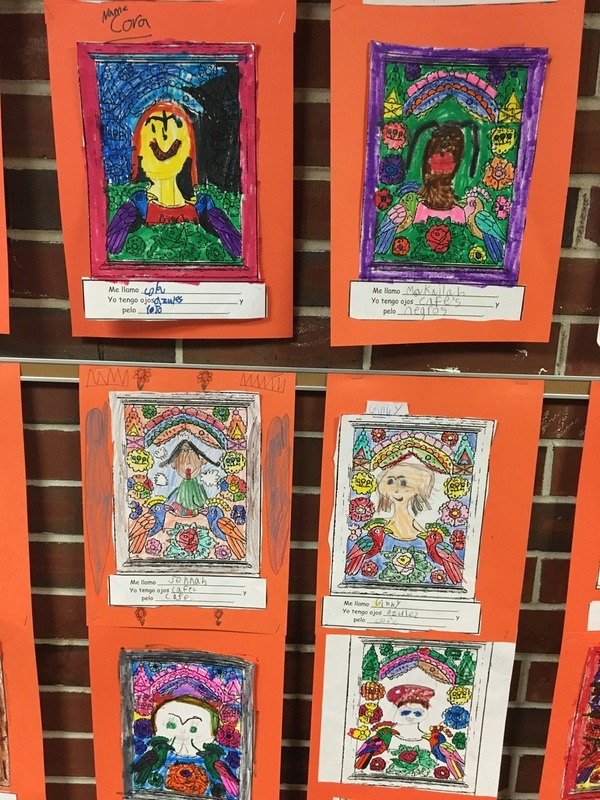 Students used skills learned in writing workshop and in art, like creating multiple drafts, conferencing and giving positive feedback. 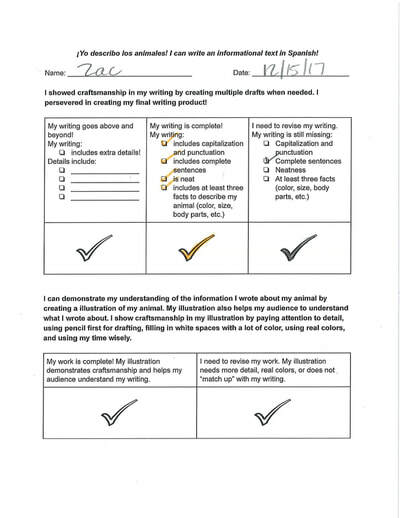 Students also used this anchor chart to help them get ideas for adding extra details to their writing. 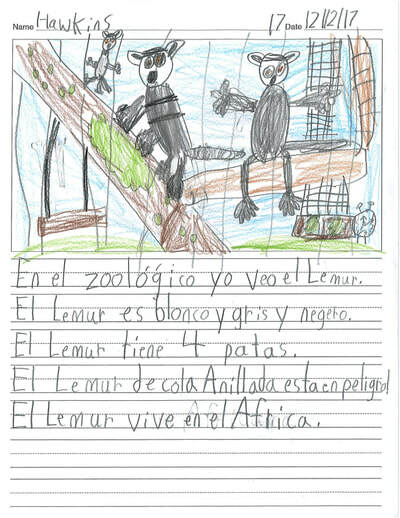 Here are some examples of simple informational text about animals in Spanish. The students practiced reading these descriptions and finding the key terms like the names of animals, the size, the colors, and the body parts. They used these example texts to help them write their own. 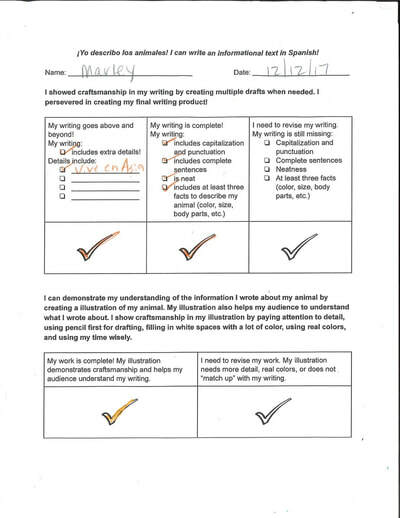 Examples of student work and the writing process. UNDER CONSTRUCTION! If your child's work is not displayed here, that just means that they are still working on the writing process. They will finish this week. You can ask them how that process is going. 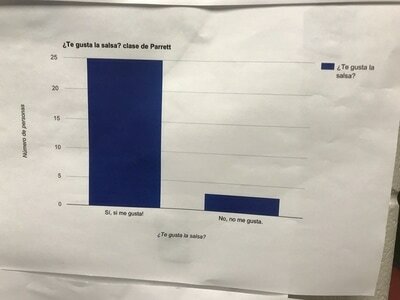 During the first 6 weeks we have been practicing our Spanish class agreements! Yo demuestro amabilidad. I show kindness. We are working together in ALL classes to show kindness to ourselves, to our peers, and to our teachers as part of strengthening our CREW. 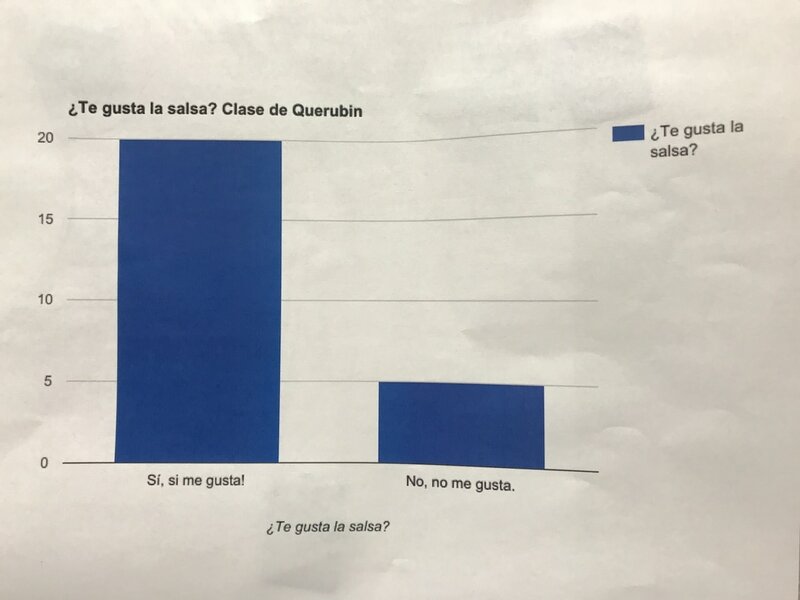 Yo miro y yo escucho. I look and I listen. 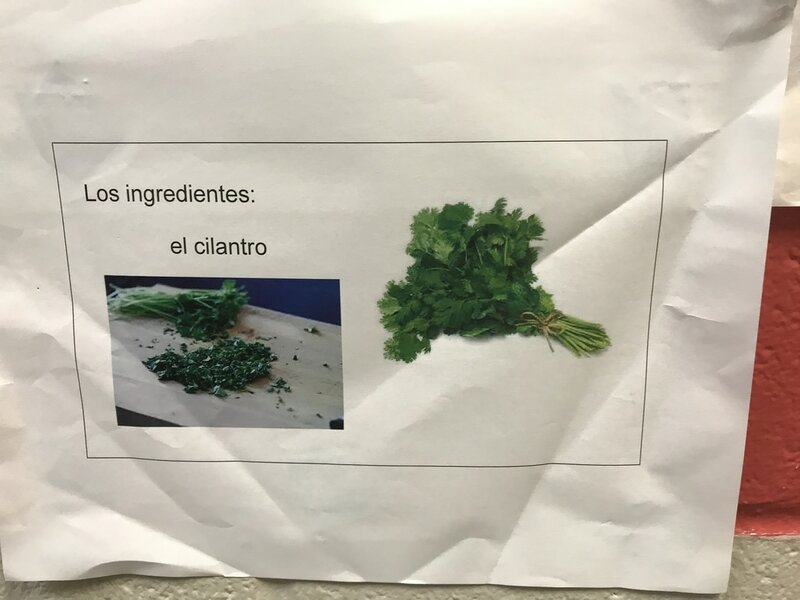 In Spanish class this is very important because Señora García gives a lot of comprehensible input in the target language (I speak completely in Spanish!). 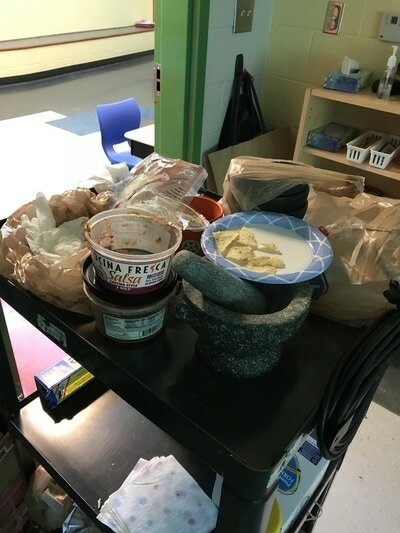 I use a lot of movements, visuals, games, realia, manipulatives, picture books, songs, dance, etc. to allow for comprehension and acquisition of the language. 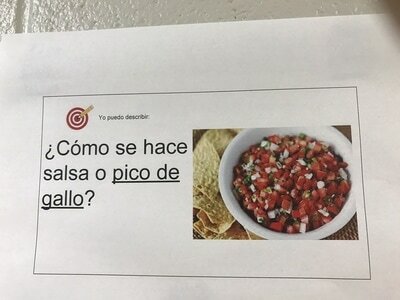 Yo hablo español! 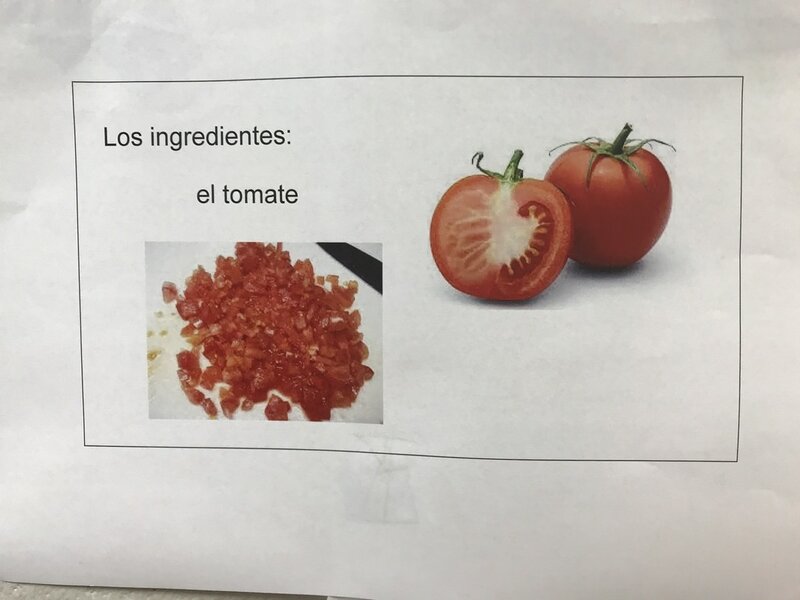 Of course, in Spanish class, we speak Spanish! I always encourage students to respond in Spanish, using as much of the language as possible, speaking in complete sentences when appropriate (even to ask to go to the bathroom!). A lot of the language production at this level is repetition or through a script or song. 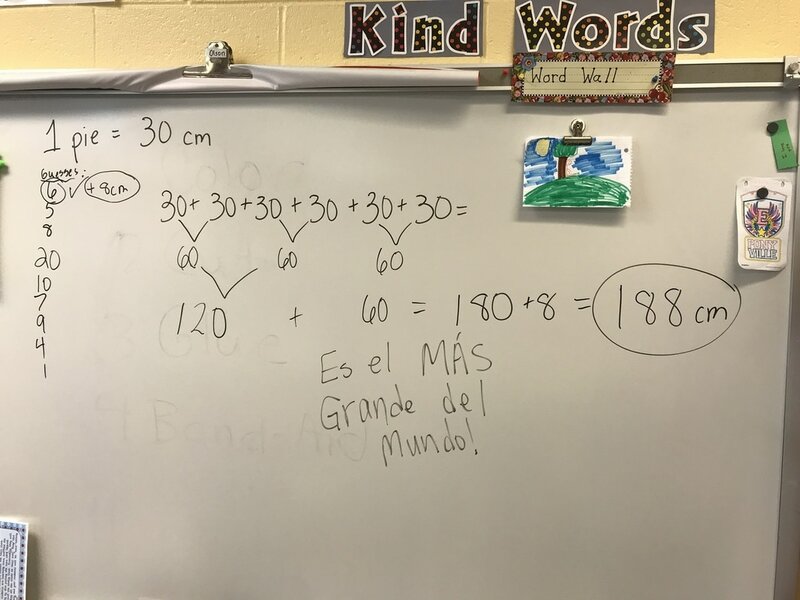 We are currently reviewing all of the colors, days of the weeks, numbers 1-30, counting using a number line, vocabulary for our classroom tools, los útiles, and modes of transportation. Students learned about transportation in Nicaragua. 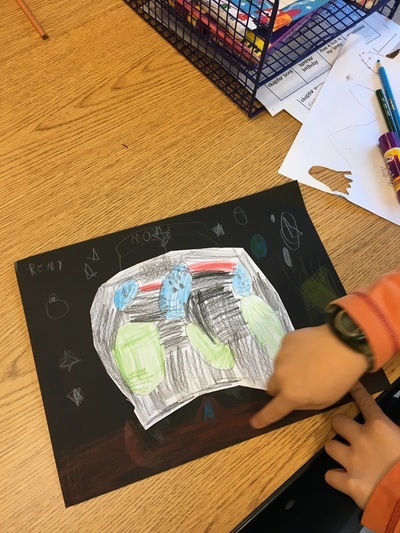 They chose a mode of transportation to draw and then wrote a sentence about it. 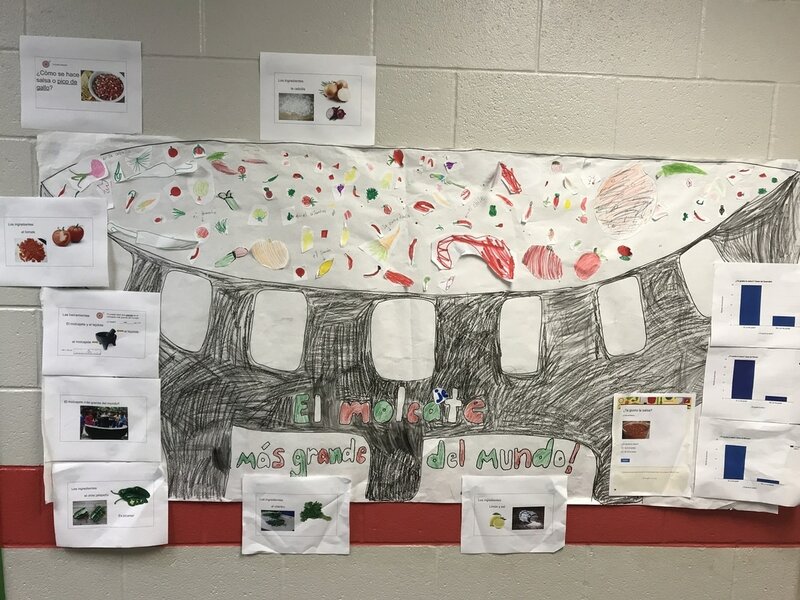 We created a class mural of transportation in Nicaragua and then graphed our sentences to practice counting how many of each mode of transportation we included in the mural. ​Students created their own Amigos de otro planeta (friend from another planet). 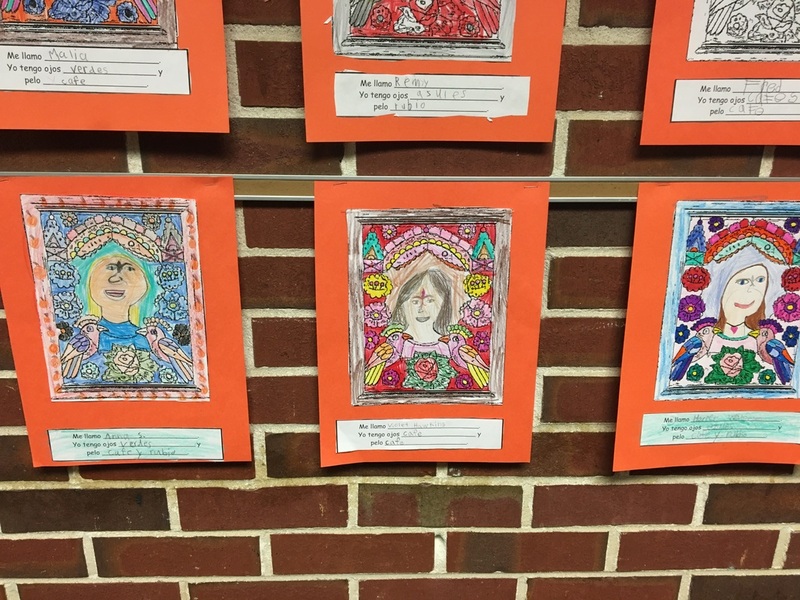 They wrote descriptions to tell its name, its color, and how many of each body part it has. 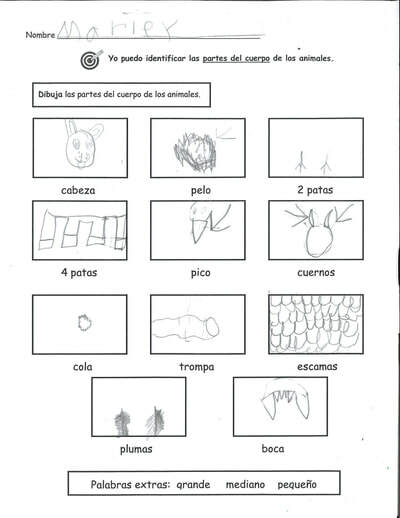 In Spanish class we learned about el conejo, or rabbit! 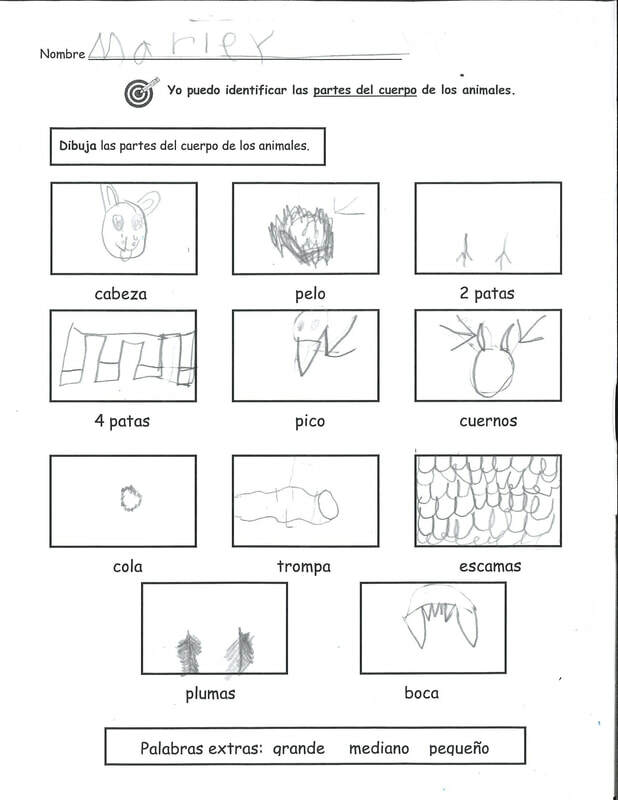 First, we learned a poem to practice the body parts of a rabbit. 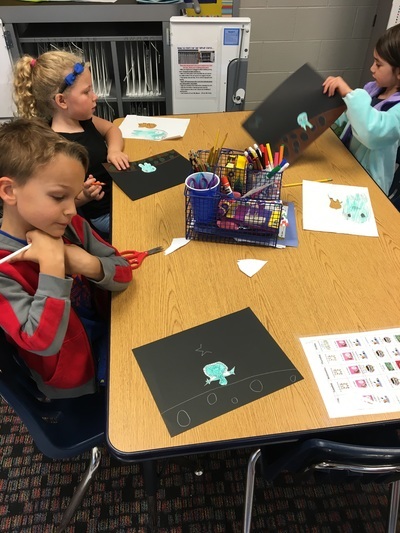 We also read and practiced re-telling an Aztec legend of how the rabbit got on the moon. 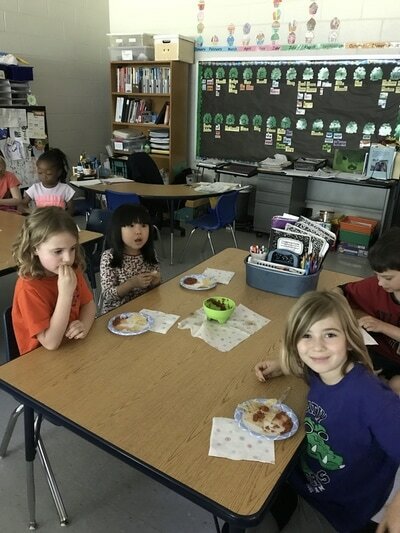 We talked about setting and characters and learned words for things in nature and landforms. 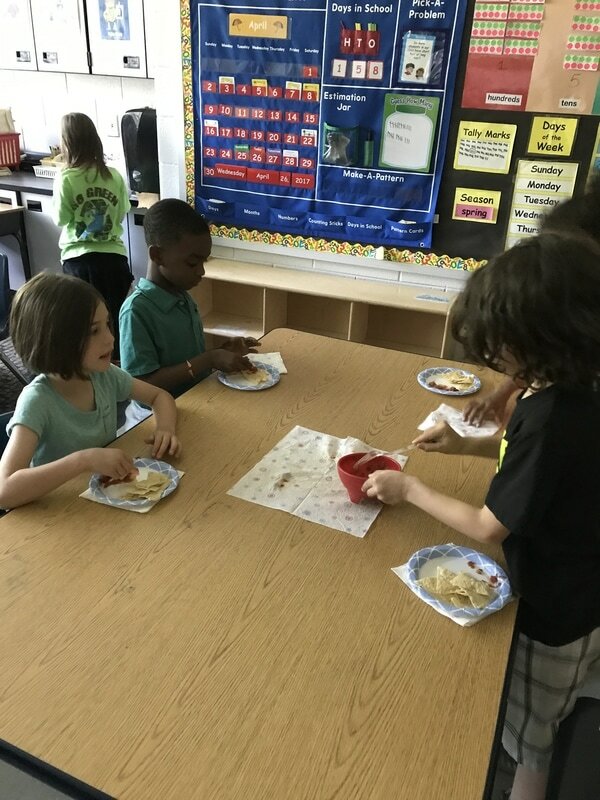 For this project, students used a reader's theater type script and collaborated to present the story in different ways. 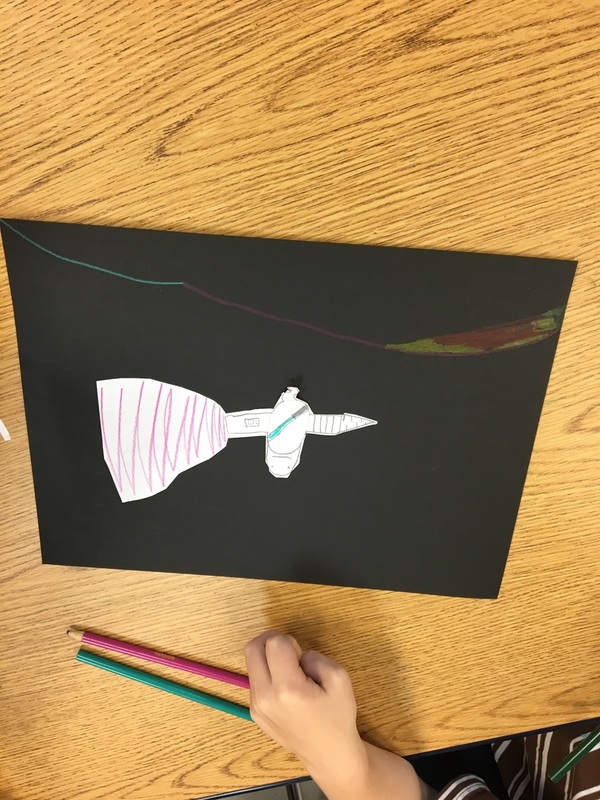 Some chose to act it out and others chose to create little puppets and props. 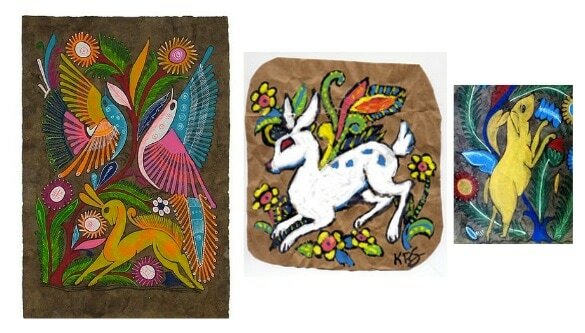 Finally, we learned about the Mexican art form of Amate paper making and painting, which comes out of the town of San Pablito in the state of Puebla. 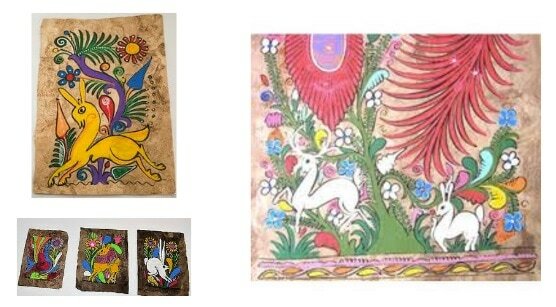 This is a very old style of paper making, dating back to its use by the Maya and Aztec people, that uses the bark of the wild fig tree. 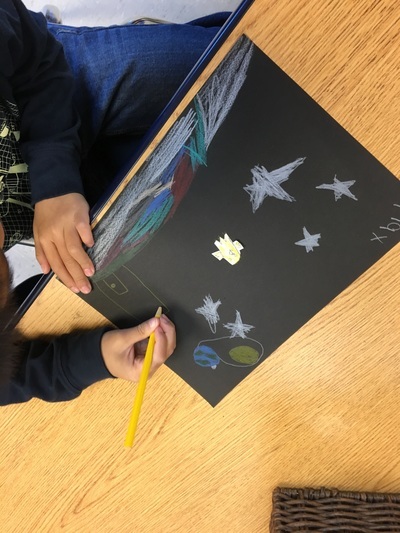 We used faux "amate" made from crumpling brown paper bags and drew natural scenes with conejos and wrote about our pictures using familiar vocabulary. 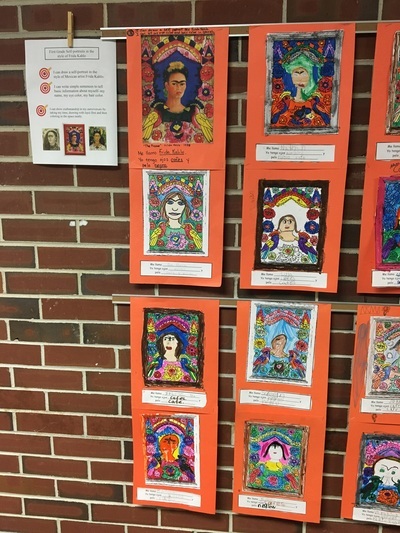 The students' artwork turned out great! The Aztec legend tells the story of how the "rabbit" got on the moon. It tells of the Aztec god Quetzalcóatl, the great feathered serpent, who decided to become human in order to see the world. He roams and roams and gets tired and hungry. He meets a rabbit that is eating grass. But as a human he can't eat grass! 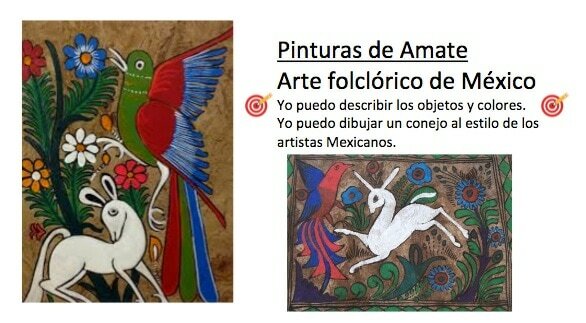 The rabbit then sees he is starving and offers himself to Quetzalcóatl. 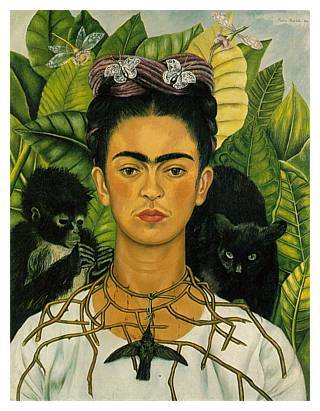 Quetzalcóatl sees how honorable this act is and decides to put his image on the moon! They both live happily ever after. 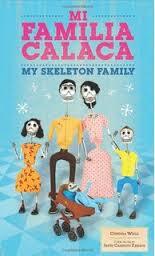 El Conejo en la Luna- Alyssa Isabella Harper from Señora Garcia on Vimeo. Click here for more info on Amate paper making! 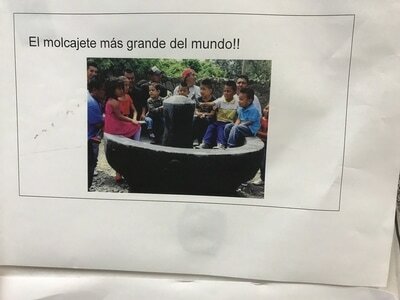 Las Frutas y los Vegetales- Making Salsa in the Molcajete más GRANDE del Mundo! 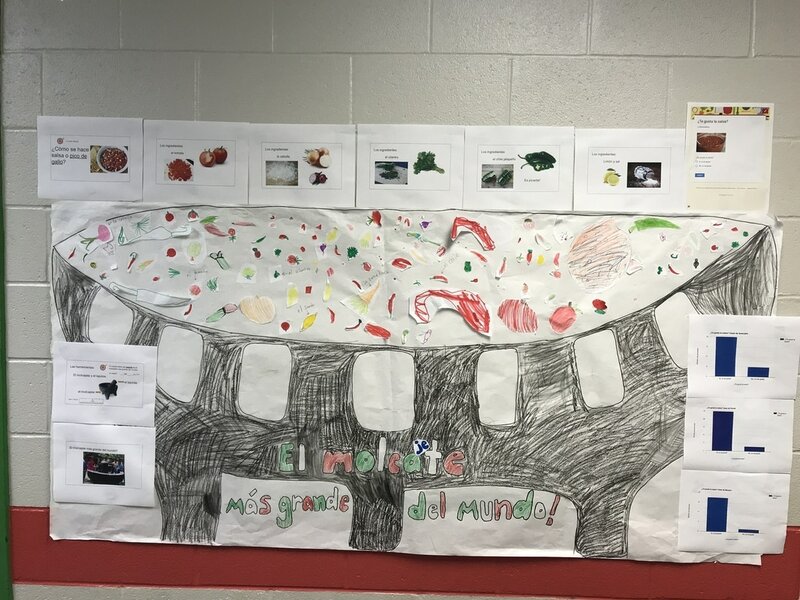 Students learned about the biggest MOLCAJETE in the world created in Jalisco, México. A molcajete is a traditional bowl carved out of volcanic rock used for making different types of salsa. In our study of fruits and veggies, students learned the ingredients for a simple salsa recipe and we had a taste test in class! 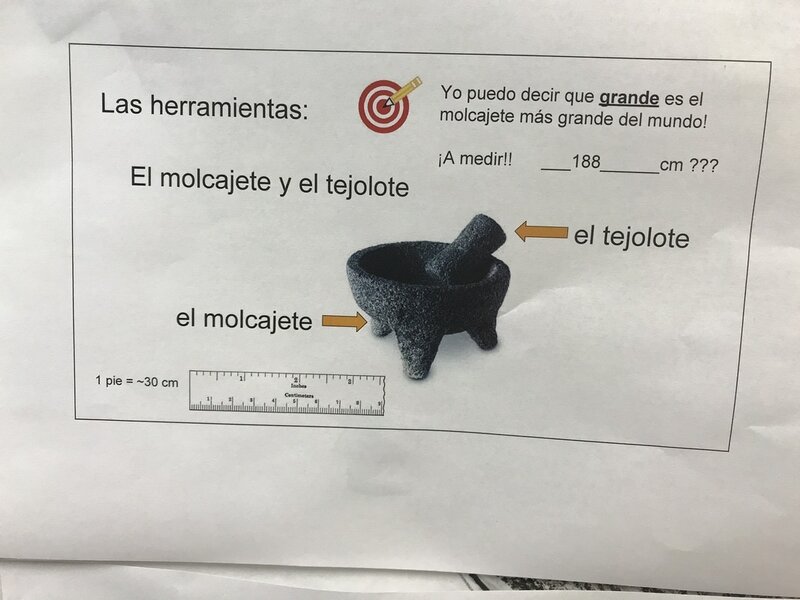 Then, we actually made the biggest molcajete in the world by measuring in feet and inches (counting, measuring) and then converting the feet to centimeters (addition). Ours was actually "bigger" than the one in Mexico! The photos of the graphs are from a survey done in Google forms for the taste test. 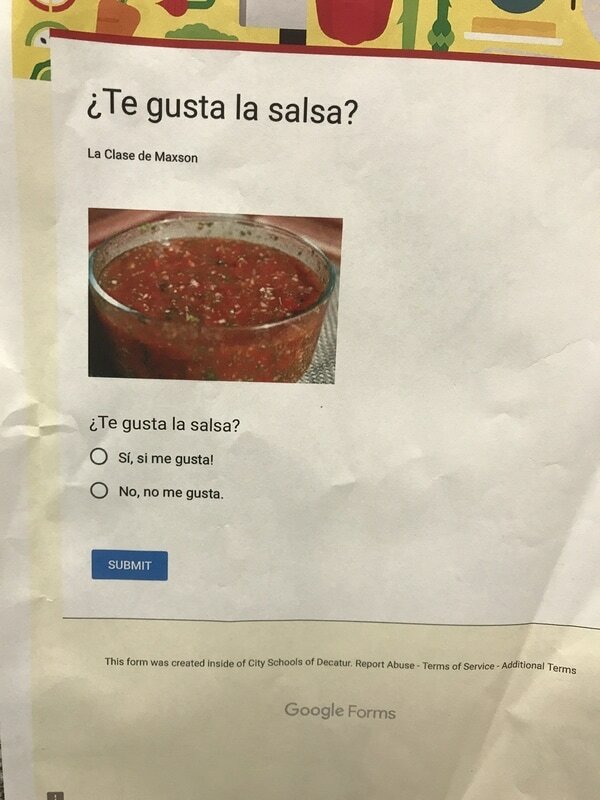 How many students liked the salsa and how many did not like the salsa? 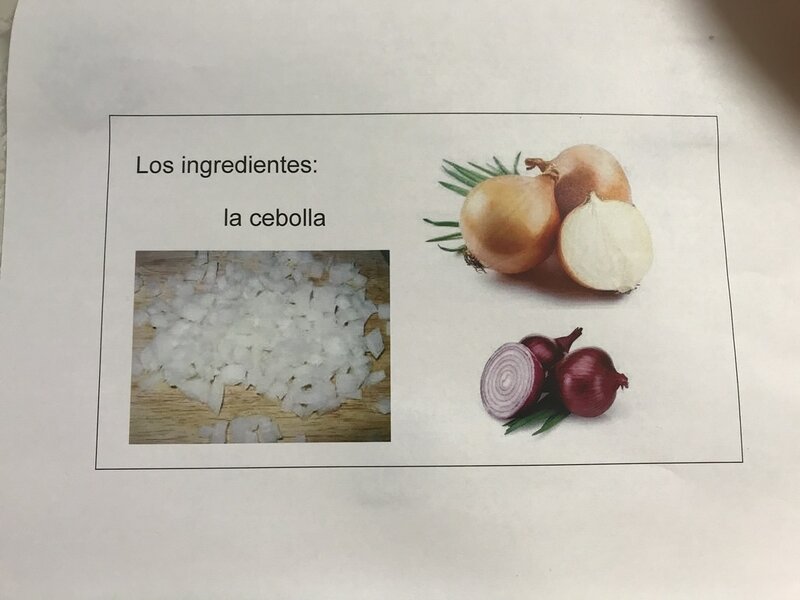 Unit 3- ​Las partes del cuerpo! This is one of Sra. 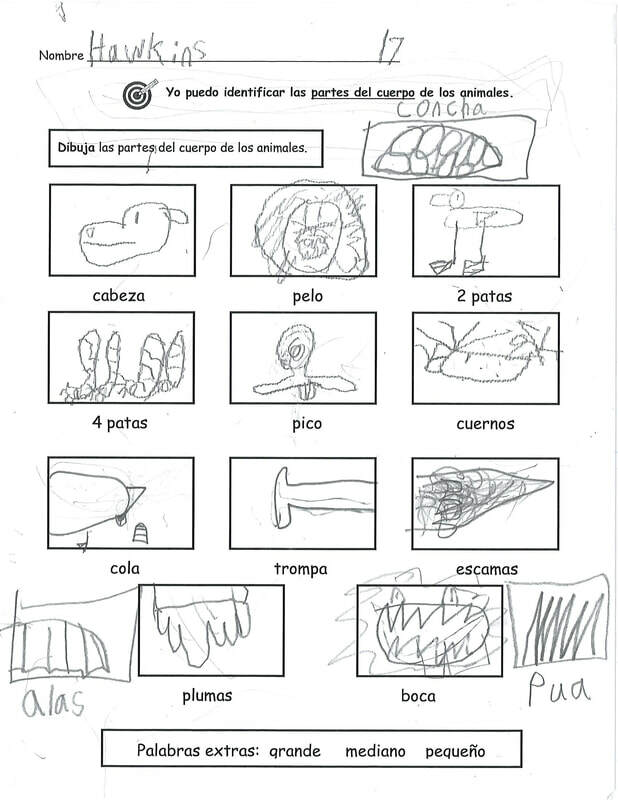 García's favorite units of study- body parts! 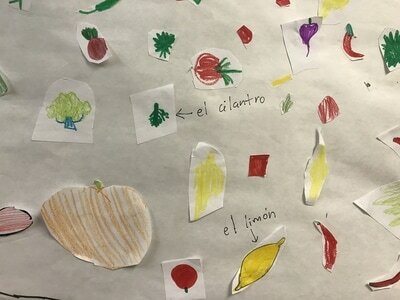 There are just so many fun songs, games, and other activities to do that help us learn the body parts in Spanish. 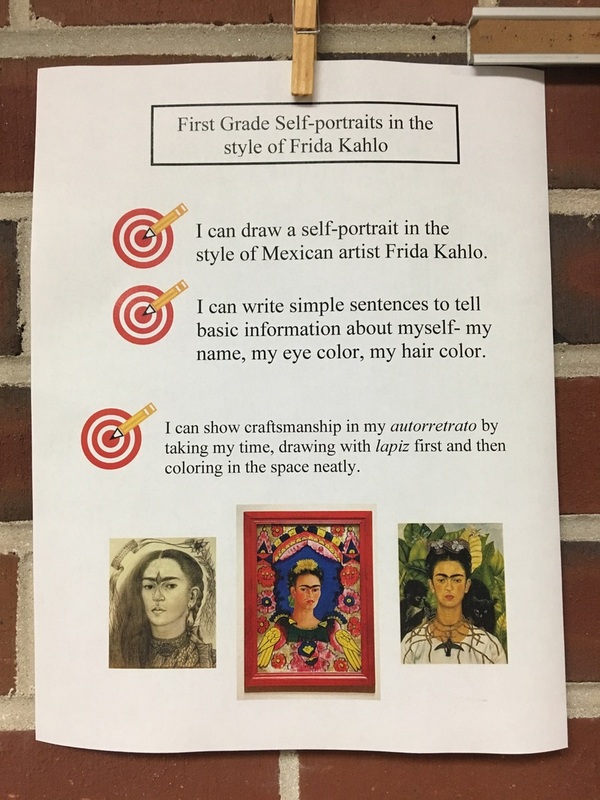 Students started out the unit telling about their eye and hair color and created self-portraits in the style of famous Mexican artist Friday Kahlo! 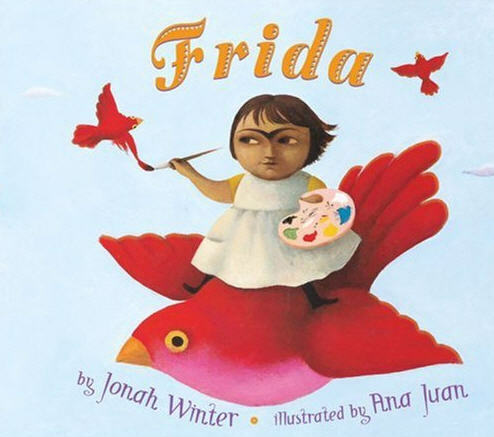 We read the children's story Frida by Jonah Winter that tells how Frida became an artist and reviewed a lot of feeling words! Frida se siente FELIZ cuando pinta! 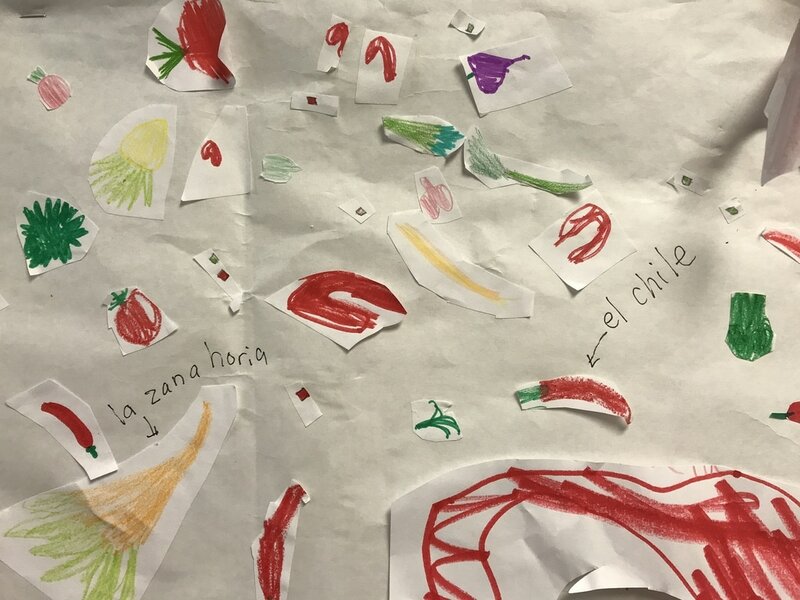 Next, we pretended to travel to Mars and watched an animation of amigos del otro planeta! 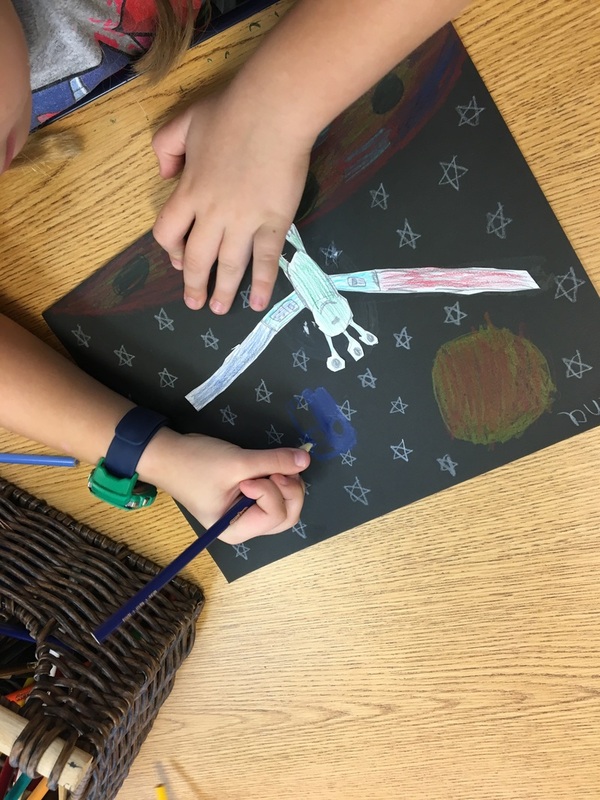 Students are designing their own "amigo" from another planet and will write simple sentences telling how many of each body part it has, it's color, it's size and it's name. 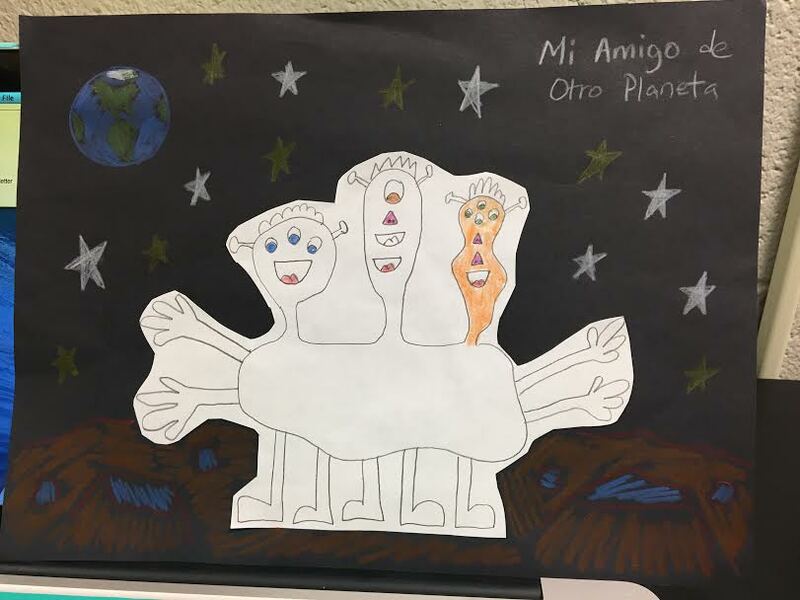 Students created their own Amigos de otro planeta (friend from another planet). 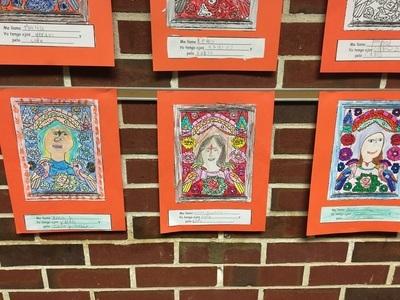 They wrote descriptions to tell its name, its color, and how many of each body part it has. The first graders are currently into their 5th unit all about mi familia! 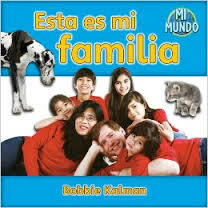 They first learned a fingerplay poem called Mi familia by José Luis Orozco to identify the basic family members. Now, students are illustrating their own families and describing each family member orally and in written form using adjectives. 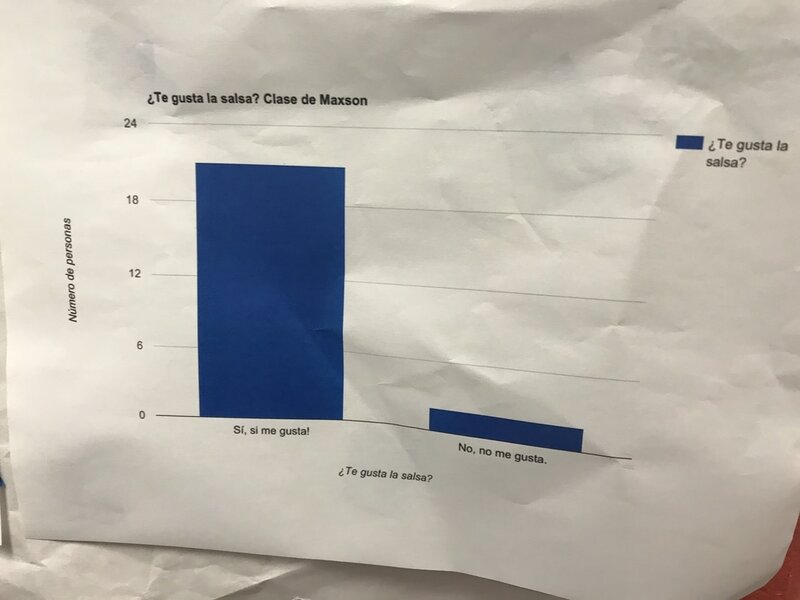 !El bebé es travieso! 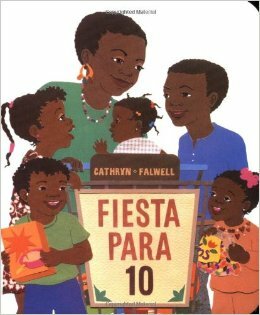 Next, we will be talking about family members, pets, and places in the home through a reading of La Casa Adormecida (The Napping House). Students also learned a traditional lullaby in Spanish, La nanita nana (Here's a nice version on YouTube: https://www.youtube.com/watch?v=MrdTSF7MMAQ) Finally, we will talk about our family traditions and those in México and students will create their very own mini piñata! 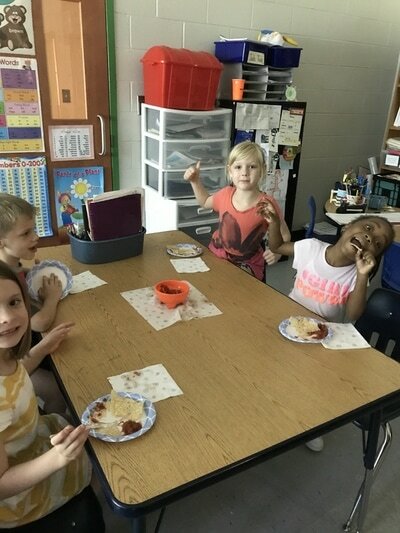 ​First grade is well into their 4th unit called Mi burro enfermo (My sick donkey- I know, funny name!). This unit is named for a song the children learn by José Luis Orozco that is all about clothing and what the doctor recommends the sick little donkey to put on to feel better. 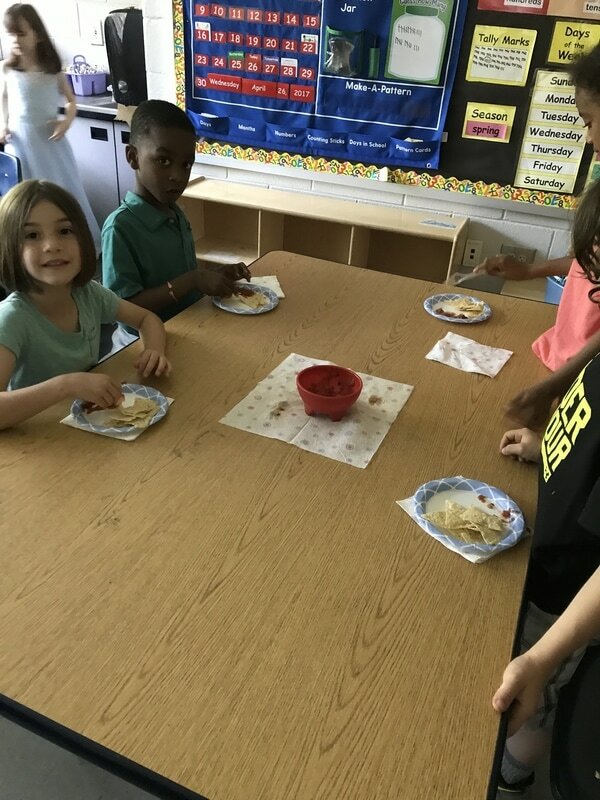 In this unit students are learning all about la ropa (clothing). We started the unit by identifying and describing clothing by color and size. Currently, students are helping to organize donated clothing for a clothing drive. 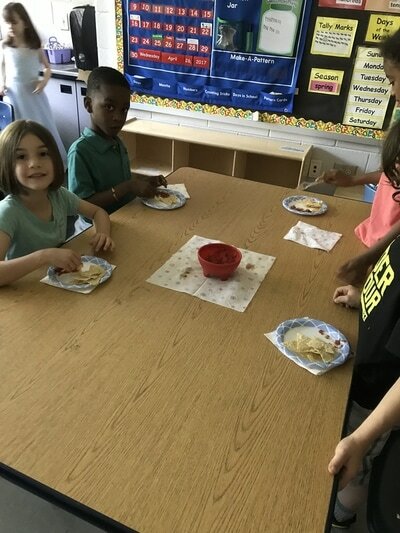 They are learning about clothing as a good and donation as a service. This event ties in with their Expedition, "Children Can Make a Difference in Our Community." All clothing will be donated to PATH Academy, a Dekalb charter middle school for immigrant and refugee students in the Brookhaven area.